Quoted disbursement charges are a best estimate only based on the property type and location entered by you in the quote form. In some cases the actual charges for those disbursements can vary. Conveyonline will always advise you if the disbursement charges will exceed the estimate provided, or if any additional disbursements are required and get you approval before proceeding any further. House & Land Package – Refers to a Contract for Sale of Land with the inclusion of a building contract. Building contract must be for a residential freestanding house and be an annexure of the land contract. Off the plan/Unregistered land – Refers to a contract for sale of a property type that does not yet exist or is occupiable. May include attached or un-attached property or vacant land that is not yet registered or subdivided. Manual Settlements – Conveyonline.com.au will only conduct manual settlements if your matter cannot be settled using PEXA at the request of the Vendor or any financial institutions involved in the settlement. If your matter can be settled on PEXA and you subsequently elect a manual settlement, additional charges will apply as determined by Conveyonline.com.au. For the purpose of this quote, it is assumed that you will be obtaining finance on your property. If you are funding the property without finance, an additional fee will apply to register your title with Land Property & Information (LPI) Office. See additional charges table below for current prices. Conveyonline.com.au will not be liable for any interest, penalties or taxes from the vendor or any other party as a result of late settlement or for any other reason. 15.1. Pre Inspection reports – Refers to Pest, Building and Strata reports. Although it is recommended to undertake these reports, the cost of these reports are not included in this quote. These reports can be sourced by us at an additional fee payable direct to the supplier of those reports. See additional charges table below for current prices. 15.2. 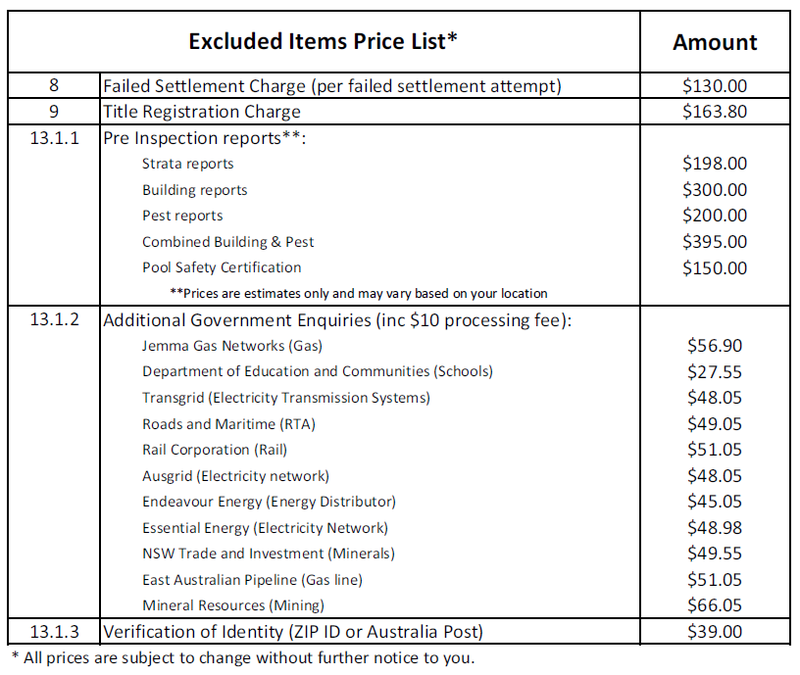 Additional Government Enquiries – Refers to any additional enquiries not listed in the inclusions. Although it is recommended to undertake these enquiries, the cost will be charged in addition to our fixed fee if required. See additional charges table below for current prices. 15.3. Verification of Identity – Due to new legislation for transfers of property, you will be required to have a face to face identity verification check with one of our ID agents ZIP ID or Australia Post. Any fees payable to our agents are not included in this quote and should be paid directly to the agent. See additional charges table below for current prices. 15.4. PEXA Fees – PEXA (Property Exchange Australia) is a state government/bank owned online property exchange network. Fees associated with performing your settlement on the PEXA network are excluded from this quote as they will be charged to you directly by PEXA on settlement. The current price for a single title PEXA transactions is $110.55. 15.5. Other Additional Works – Any additional works requested by you, your mortgagee or any other parties to your transaction that falls outside the normal scope of a standard conveyancing matter will be charged at an additional rate as determined by conveyonline.com.au.